In the medieval history of Europe, we think of the Vikings as people who came from what is now Scandinavia, who had ships and swords, who raided the coasts of northern Europe, settled down and founded towns with names like Grimsby (Grim's Village), did dairy farming so that they could make Jarlsberg cheese, and had blonde-haired children called Anderson, Ericson, Johnson, and so on. I am writing this during a visit to Iceland which, we are told, was settled by the Vikings in the ninth century. Today, the country has a population of just 320,000. All of them, I am told, consider themselves descendants either of the original Viking settlers, or—if they are a bit more dissident—of Celtic slaves the Vikings brought with them. An Icelander, Leif Ericson, was the first European to discover the Americas (not the tardy Columbus, 500 years later). 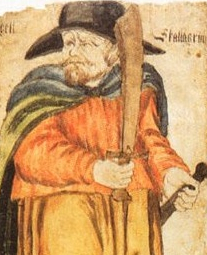 The Icelandic Sagas are episodic prose stories, written between about 1200 and 1400. The language has changed little since then, so the Sagas can be read in the original by speakers of modern Icelandic. They are the source of much of what is known about medieval Viking society. They depict family conflicts, and the exploits of prominent men who often combined raiding and farming who lived two or three hundred years before the Sagas were written down. Icelanders look to the Sagas in the same way that Italians look to Dante, and the English look to Shakespeare. Egil's Saga was recommended to me, so I have been dipping into it. Egil is good at seeing how things may turn out in the future. He can be both kind and breathtakingly cruel. "Very human," said my informant! I am trying to formulate my idea of the prototypical Icelandic male. He's five-foot-ten and burly. He draws on the idea of the Vikings, so he wears an anorak and he has a beard. One style of beard displayed by the younger men is a six-day stubble while the other, which gives an impression of permanence, is trimmed to about a half-an-inch in length, grizzled with a whitish patch on the chin. This prototypical man gives the sense that he's not to be put upon. I imagine him having a sword stashed away somewhere at home in a wardrobe. The prototypical female wears a woolly jumper and three-inch heels, not of the slender variety but chunky so that they can be marched on. My initial theory was that the function of these heels was to enable the wearer to have her eyes at the same level as those of any male she might meet without the annoying effect of sexual dimorphism. But when I asked some women about this, they agreed that the chunky heels were characteristic but they laughed and said, "It's nothing to do with being at the same height as men." Among my duties on this visit was to give some lectures at the University of Iceland, one of which was on the emotions. "It's a novel topic for us," said one of the women who invited me, "because we Icelanders don't have emotions or, if we do, we certainly don't talk about them." When I asked someone else whether it was true that Icelanders don't have emotions, he said "Yes, it's perfectly true. Instead, we have sheep." Although Iceland is ringed with volcanoes and glaciers it does have sheep, one-and-a-half for every Icelander, so that may explain the prevalence of woolly jumpers. The books say that around the year 1000 Christianity came to Iceland. When I talked with people about this I said that it wasn't clear what Icelanders made of it, since they seemed to prefer the Sagas. "That's right," they said. "We're still not sure what to make of it. If you want Christianity, you have to go to Norway." I'm not quite sure whether I'm on the right track, but perhaps I've made a start on the Icelandic personality: friendly, humorous, not as politically correct as the Swedes, not quite as jokey as the English, independent-minded. Although Iceland has abundant electricity from hydroelectric and geothermal sources, and although most heating is provided from hot water which is conveniently provided just under the ground, I've read that there are almost no natural resources and hardly any manufacturing. But there's an abundance of cars from Germany and Japan, of furniture from Sweden, of computers from America, and so on. I kept asking people to explain how, despite ups and downs, Iceland remains so prosperous. They've been unanimous in their replies. "It's a mystery," they said. 1) Do plot-driven stories affect people in the same way as character-driven stories? Are character-driven stories more effective than plot-driven stories in influencing readers' views of the social world? 2) Do you think the results of your research applies as well to comics and graphic novels? Thanks for this very interesting comment. Neither we, nor to my knowledge, other people have done the research to answer your question about character-driven versus plot-driven stories properly. My intuition, and prediction, would be that character driven stories would indeed enable people to think more deeply about others and themselves. I think that the kind of result we find in our research, of fiction enabling people to understand others better, ought to work for graphic novels ... but again, so far as I know, the studies haven't been done.